It's been a while since I've spent some time gettin' inky and I've had alot of fun working on this tag with distressed and inked edges. 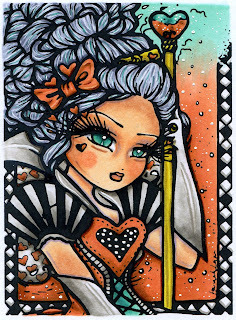 I've used Queen of Hearts digital stamp by Hannah Lynn on a standing tag. I printed the image onto Bazzill Smooth white cardstock then die cut it using a Sizzix Tim Holtz Alterations Tag and Bookplates Bigz L die. Here's a closer view of my Copic-filled image. I reduced then printed my colored image and used Ranger's matt glossy accents to adhere it to a Tim Holtz idea-ology rectangle facet. This wonderful embellishment hangs from a jump ring with a Tim Holtz idea-ology Bauble at the loop of a Tim Holtz idea-ology Trinket Pin through a studded black grosgrain 3/8" Michael's ribbon tied through my tag's top. I placed a mask over my colored image then using a non-stick kraft sheet, I inked the edges of my white tag with Ranger's Distress inks in Wild Honey, Tumbled Glass, Stormy Sky and Frayed Burlap. When dry, I began to stamp Alice in Wonderland-themed words from a Crafty Secrets Tea with Alice large stamp set. 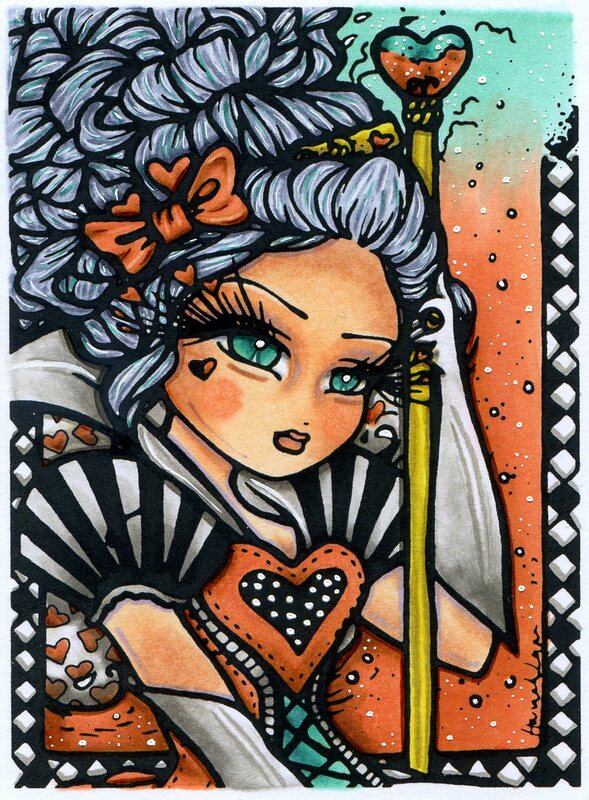 Here's a view of the front of my tag showing how I've used Queen of Hearts. A Prickley Pear stamped Queen for a Day sentiment is popped up over the base of my image. A Creative Impressions Bits of Bling white mini pearl sets on her ring finger while a strip of Kaiser Craft white pearls are lined up at the left side. A Sizzix Tim Holtz Alterations ATC & Corners die cut provides the black cardstock photo corners surrounding my image. I adhered my tag to another die cut tag to cover the Copic bleed and messy ink. 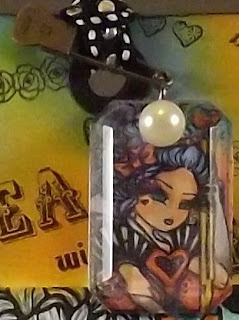 The back of the tag includes a Tim Holtz Alterations Small Easel die cut to allow my tag to stand for display. A very sweet and beautiful little tag.Love it! Thanks for joining us at Stamptacular Sundays this week. Gorgeous tag/picture! I love the teeny tiny version of the image! GORGEOUS! I just went over to Hannah Lynn's site to check out other images!! Thanks for joining us this week at Creative Card Crew! Wow this is really fabulous. Totally love how creative you are. Just love what you have done on this tag as embellishments! Hi Rose - this is fabulous - brilliant colouring and I love how you've shrinked it and put under one of those facet thingies! Gorgeous! This is fantastic! Thanks for playing with us this week at One Stitch At A Time! Hope to see you next week! Gorgeous colors and coloring. Love the facet with the smaller image. Beautiful design and tag! Glad you joined us at Simon Says Stamp and Show! Wow, wow, wow, what a super tag! Crafts and Me Stamps Challenge: Tag It!